Bollywood is the informal term (Bombay + Hollywood) popularly used for the Mumbai-based Hindi-language film industry in India, which is one of the largest film producers in the world. The dancing in Bollywood films, especially older ones, is primarily modeled on Indian dance: classical dance styles, dances of historic northern Indian courtesans (tawaif), or folk dances. 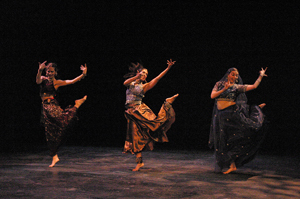 In modern films, Indian dance elements often blend with Western dance styles (as seen on MTV or in Broadway musicals), though it is not unusual to see Western pop and pure classical dance numbers side by side in the same film. The hero or heroine will often perform with a troupe of supporting dancers. Many song-and-dance routines in Indian films feature unrealistically instantaneous shifts of location and/or changes of costume between verses of a song. If the hero and heroine dance and sing a pas-de-deux (a dance and ballet term, meaning "dance of two"), it is often staged in beautiful natural surroundings or architecturally grand settings.